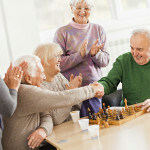 While it’s great to have an “all hands” approach to meal service to enhance the dining experience and resident satisfaction, it’s essential to ensure that staff being utilized to assist with feeding your residents have received the appropriate training and that the facility has a record of this training. We all know our responsibility is to ensure residents receive a meal that meets their nutritional needs, food is at acceptable temperatures, the correct consistency is served, and that necessary assistance is provided to complete consumption of the meal. Just remember that if your facility is or plans to use staff from a variety of departments who do not have feeding assistance training as part of their training curriculum, you need to provide them with the required state training before they assist with feeding. But, beyond that, you should also be monitoring to ensure that staff feeding residents are adhering to all protocols related to safe feeding, infection control and the other areas listed above.